This amazing photo of the bride and groom was taken at Atlantis Banquet Hall during the couple's first dance. To add to the atmosphere, I pulled a string of battery operated Christmas lights and placed them in front of the lens. For this portrait I used my beloved Canon 85mm f1.2 L lens which, when it focuses can deliver amazing imagery. 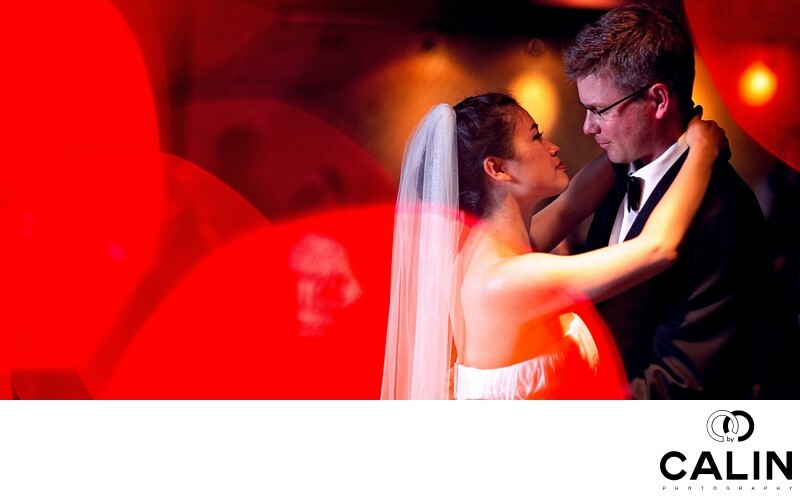 What makes this shot memorable is the bride and groom looking intensely into each other eyes and the red globes of fire created by the Christmas lights. The bride's arms are placed around the groom's neck. The tungsten lights in the background complete the image and give this shot dimension and depth. There are three planes of view in this image: in the foreground we have the foreground bokeh created by the red lights. The middle ground is dominated by the newlyweds having their first dance. Finally the background is defined by the orange lights.